On the night of the State of the Union address, President James Allaire expects to give the speech of his career. But no one anticipates the terrifying turn of events that forces him to quarantine everyone in the Capitol building. A terrorist group calling itself “Genesis” has unleashed WRX3883, a deadly, highly contagious virus, into the building. No one fully knows the deadly effect of the germ except for the team responsible for its development—a team headed by Allaire, himself. The only one who might be able to help is virologist Griffin Rhodes, currently in solitary confinement in a maximum security federal prison for alleged terrorist acts, including the attempted theft of WRX3883 from the lab where he worked. Rhodes has no idea why he has been arrested, but when Allaire offers to free him in exchange for his help combating the virus, he reluctantly agrees to do what he can to support the government that has imprisoned him without apparent cause. 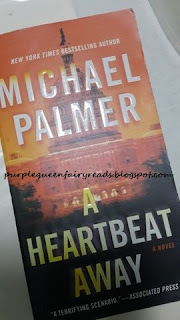 Having high expectations from my thriller, I wasn't putting much high hopes in A Heartbeat Away. I haven't read Michael Plamer before and there's a lot of 'so so' thriller in the market so you can't really blame me for being pessimistic. A Heartbeat Away started off by trying to change my mind and change my mind, I did for it was a very exciting start. The virus was released and the president seems to be taking control and I was looking forward to an exciting read. However, like a few books that I read recently, the author wasn't able to maintain the momentum and the book lost it's thrill factor a bit toward the middle of the book and it was quite a struggle to read and I developed a dislike towards the president but I am happy to share that that drop in momentum was just for a couple of chapters and the story picks up again and ended in a high note. A Heartbeat Away indeed is a wonderful thriller and you can be sure I shall be on a lookout for other titles by Michael Plamer.